Finally, the big game is about to start. You’ve cracked a cold one and have some game day snacks by your side. But do you have your mobile device on hand? As a company looking to improve your inbound marketing strategy, you’re clearly scouting out ways to leverage social media, right? If you haven’t already joined the social media bandwagon, you’re setting your team up for a loss. The first play of the game requires getting on the social bandwagon and making it an all-star player on your marketing team. A company without a social media strategy is like the Eagles without Wentz or Foles - no touchdowns and no happy fans. And yes, if you haven’t already guessed it, this article will be jammed with as many football references I can possibly fit in preparation for an epic, mind-blowing, glory-story Super Bowl. One that ends with the Eagles Victory Song being sung across all the land. Or at least the greater Philadelphia region. But I digress, where was I? Oh right, social media. What are you waiting for?? Engage your audience by sharing remarkable content that is relevant to the big event and adds value to the game-day experience. And yes, if you’re a product of service other than snack foods, sports equipment, energy drink, or pain relievers, this will require some extra creativity. The extra effort will lead you to victory! Not only will content driving traffic to your website generate new leads and build a community, it can be reused and repurposed in every stage of your inbound methodology. Best of all, it’s free! This is your chance to go viral! Pay attention to the game, the commercials, the halftime performance and everything else in between to make a clever contribution to the enormous online conversation that is the Super Bowl. No, not Nick Foles or Tom Brady. I’m talking about Twitter and Facebook. Be clever and spontaneous. Capitalize on events that are happening live and turn them into something relevant to your company. Don’t be afraid to think on your feet! Take Oreo for example. This example is an ancient tale by now, but that doesn’t mean it’s lost potency or brilliance. Remember back in 2013 when a blackout in the stadium caused over a half-hour delay while the Baltimore Ravens and San Francisco 49ers had to put a pause on their fight for the championship title? 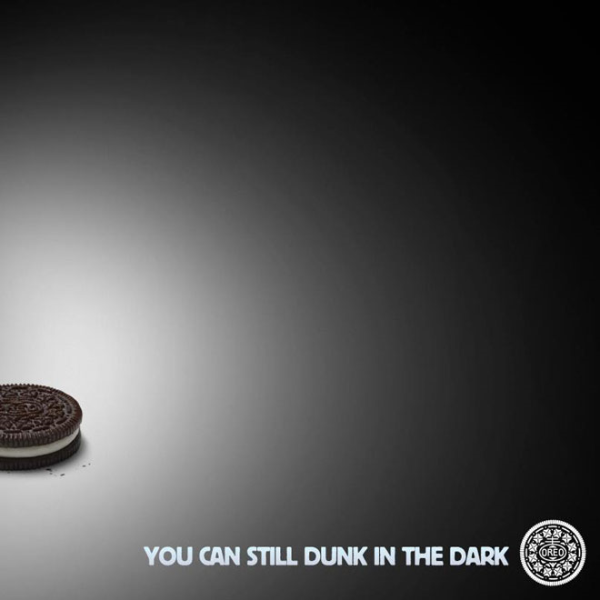 In that moment, Oreo saw a perfect marketing opportunity and posted the following picture on Twitter. In just 1 hour, this simple image with a dark background and 7 words had over 10,000 retweets, making it more effective than a super bowl commercial that companies pay millions for! Who doesn’t love to laugh? Give them something to laugh about by incorporating humor into your social media posts through memes, GIFs, etc. And while totally random humor can be funny and might even be a smart offensive play, it might be easier to keep the funnies related to what’s going on during the game and with your company. 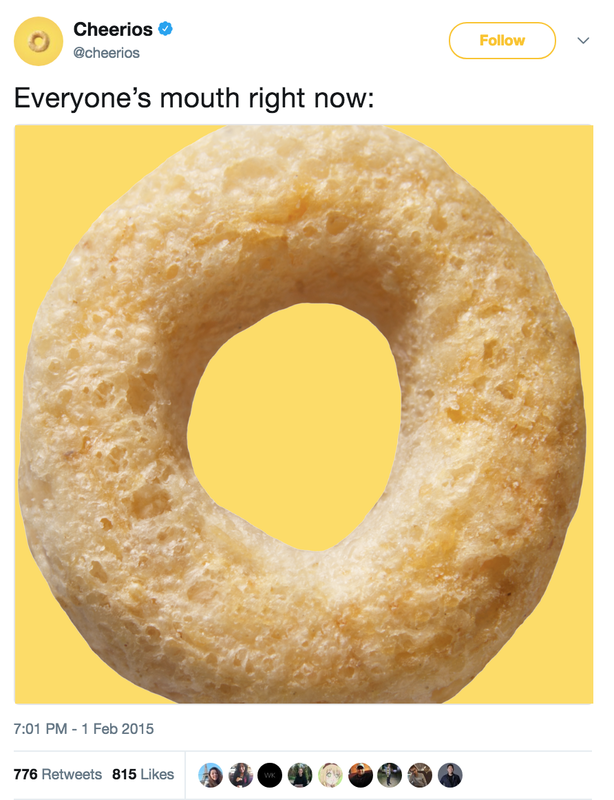 During the 2015 Super Bowl, Cheerios tweeted this during the insane game-ending interception. With 776 retweets and 815 likes, our mouths dropped too with how easy that was. Perfectly timed, funny and successful - that’s all it takes. We all know a picture is worth a thousand words, but what about videos? Platforms like Facebook and Instagram added a video component for a reason. As shown on HubSpot’s website, they make outstanding content! Post a video through Snapchat, Instagram, or YouTube to share with your audience what you’re doing Super Bowl Sunday. Let your audience experience a day in the life of a company they admire. Game day prep can give your company tons of content to share on platforms such as Pinterest, Facebook, and Instagram. Don’t wait until the big day to create your game plan — that’s got penalty written all over it. Spontaneous inspiration can produce some pretty authentic and in-the-moment social magic, but don’t rely on it. Know your plan, be ready for flawless execution and if you’re one of the lucky companies who gets to capitalize on the real-time opportunity to shine brilliantly, that’s just a little extra shine on the Vince Lombardi trophy for you. Or icing on the cake. Lots of icing on the cake. The possibilities are endless, so get creative! Check out how food brands like Doritos are optimizing the pre-game action by giving party-goers some tasty recipes to try. Promote engagement from your audience by asking them to comment on the post if they’ve tried your “how-to”. Or, ask them to share pictures of how their game day recipes turned out. Not only will this make your company likeable, it will make you more memorable and make the audience more likely to do business with you in the future. The post game is just as important as any other point in the night. According to Nielsen, “social activity for game peaked between 10:30 p.m. ET and 10:34 p.m. ET when 7.5 million interactions occurred after the New England Patriots defeated the Atlanta Falcons.” Granted, that was an EPIC Super Bowl ending, but still the potential for social activity post-game is just as important as before kickoff and from Q1 - Q4! Be creative with your wording and spark a conversation. The more views you get on social media and get people talking, the better! 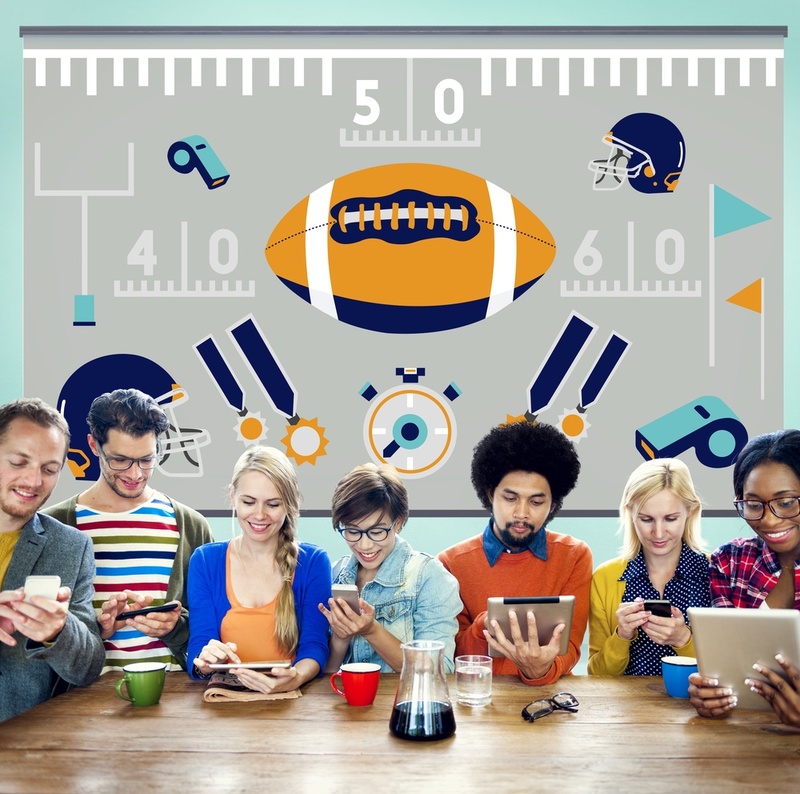 Which social platforms will you use during Super Bowl LII? Now what about using social media post-Super Bowl? How strong is the social media component of your marketing plan overall? Whether you’re a B2C or B2B company, social media can’t be ignored if you want to rise above your competition and soar to MVP status with your customers and prospective buyers. A targeted, integrated marketing plan inclusive of social media is the roadmap you need to achieve your growth goals and brand objectives. A defined plan keeps you focused on the activities that matter most. We created a list of 16 marketing must-haves for 2018 that will help you build or fine-tune your plan of action and get started quickly. Rachel is an intern at Stratus Interactive interested in all things social media and digital marketing. 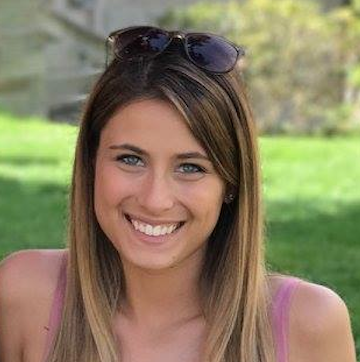 She is receiving her bachelor’s degree in Communication Studies with a Marketing concentration from West Chester University in May! She is a Jersey girl with a love for corgi puppies and traveling. See all Rachel Schack's posts.